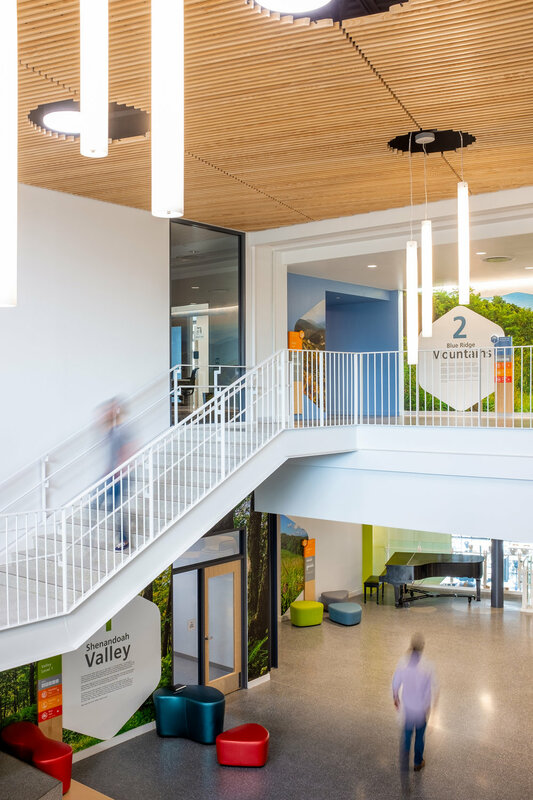 With a focus on welcoming the diverse student body of Bluestone Elementary School, the themed wayfinding graphics emphasize the unique local landscape while connecting geological similarities to global landscapes. 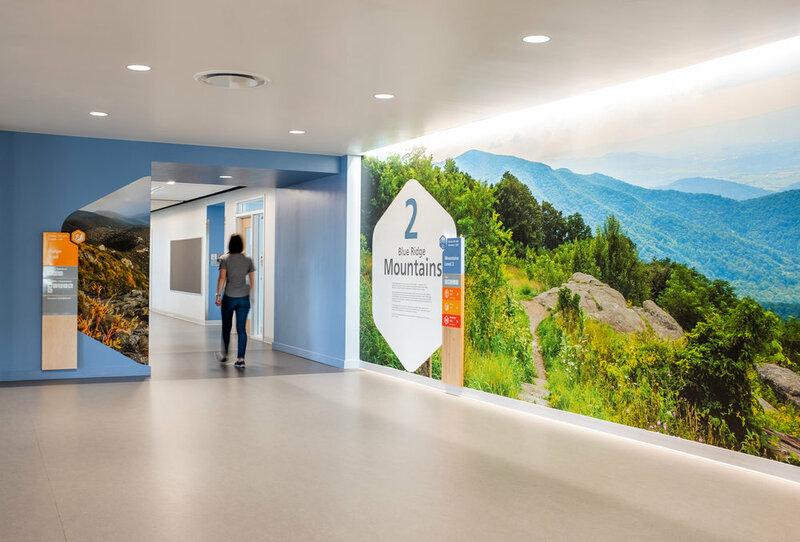 Shared spaces feature graphics connecting the similarities of Harrisonburg's local sites to unique landscapes across the world highlighting the beauty of global diversity for the students. Harrisonburg City Public Schools is one of the most diverse school systems in Virginia representing over 60 different countries and speaking over 50 different languages. Bluestone Elementary School's design embraces cultural diversity while highlighting the relationship between the city and its global context. These design elements help students relate to their larger world while feeling part of their community and landscape. The design team used the unique local landscape of Harrisonburg, nestled in the valley adjacent to Shenandoah National Park, as a narrative for the wayfinding system. Moving through Bluestone mimics exploring a park for students. The 3 floors are themed Caverns, Valley, and Mountains after the geology of the area and construction of the building. Each academic wing is a different trail with each classroom representing a different local species. 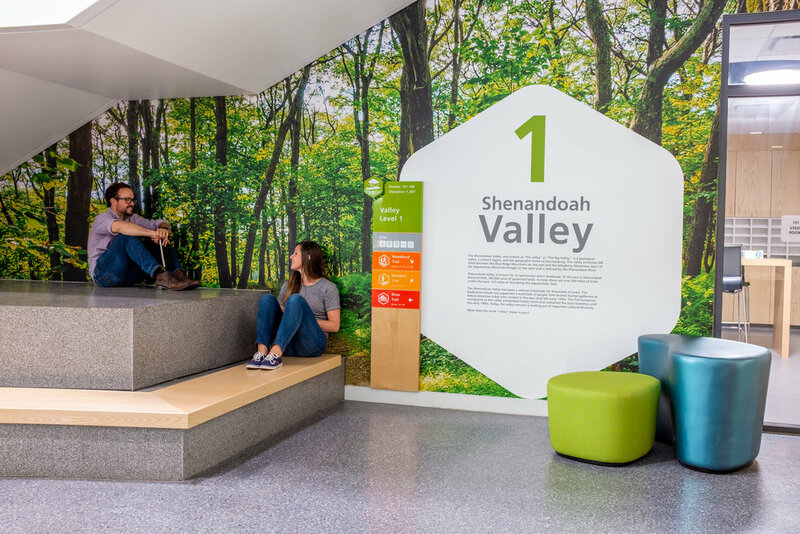 Shared spaces feature graphics connecting the similarities of Harrisonburg's local sites to unique landscapes across the world highlighting the beauty of global diversity for the students.